Is a universal basic income the answer to automation? While technological advancements in artificial intelligence (AI) and robotics will clearly make a lot of processes easier and more cost-effective, the impending repercussions need to be addressed before the inevitable happens. As automation begins to take over several jobs, the world is turning to universal basic income (UBI) as a possible solution to the anticipated unemployment it will create, which is estimated to be in the millions by the end of the decade. One proponent of such a system is Andy Stern, author of the book “Raising the Floor: How a Universal Basic Income Can Renew Our Economy and Rebuild the American Dream.” Stern spent 38 years of his life working for the Service Employees International Union (SEIU), a labor union that aims to improve the lives of workers and their families. He resigned after serving as its international president for 14 years. In an interview with Vox, Stern talks about how he believes that the American dream is sure to die unless we become proactive about finding a way to keep it alive. “I think that if people don’t intervene right now, it will [die]. Fifty percent of Americans say they don’t believe in the American dream, and they’re justified in believing that,” he says. “People with college degrees are not making anywhere near the kind of progress that their parents made, and that’s not their fault,” he added. 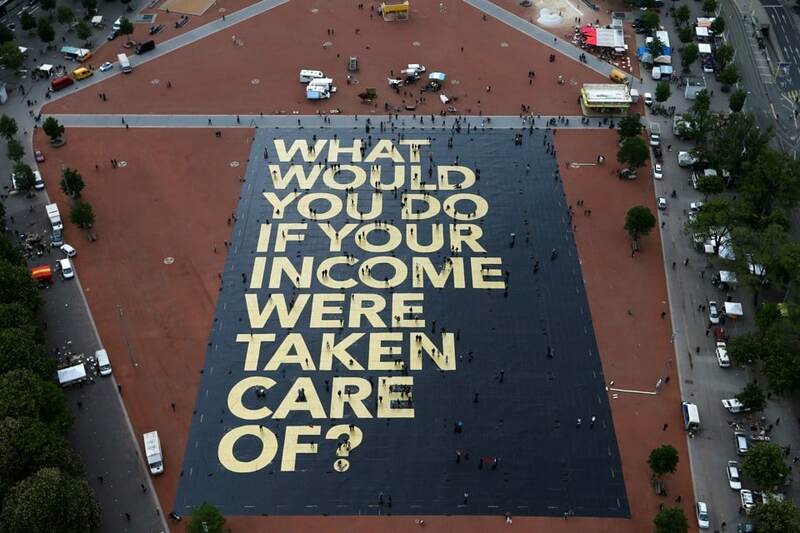 A pro-UBI poster in a square in Geneva, Switzerland. Denis Balibouse / Reuters. Unsurprisingly, not everyone thinks a UBI is a good plan. In an article published in the National Review, Manhattan Institute senior fellow Owen Cass counter-argued a $13,000 annual UBI proposal, saying it’s not enough for a person to live on and ultimately a terrible idea. But Stern and others argue that a UBI is not meant to burden the state to give people an extravagant lifestyle — just enough money to ease the financial insecurity brought upon by automation and technology. Some, like London’s Adam Smith Institute fellow Tim Worstall, believe a UBI system would be “actually cheaper than the current system” of social security, food stamps, and welfare. Several countries have announced plans to conduct test runs for UBI systems, including the Netherlands, Finland, Canada, and Uganda, so hard data on the practicality and pros and cons of such systems should be coming soon. With an estimated 57 percent of the world’s jobs at risk of being replaced by automated systems, that insight can’t come soon enough.